The Rolling Ficelle, Pollack Ficelle ($8.50). The Pollack is a nicely rounded sandwich consisting of slow-roasted pork with Swiss cheese, caramelized onions, grilled jalapeño, cilantro and lemon-garlic aioli. I loved how the tangy aioli complimented the cilantro and savory pork. The bread was really good too, with a crispy (but not hard) exterior and soft, flavorful interior. If there was any gripe it was that the meat was a little dry. But otherwise very good. SUNdeVICH, Havana ($10). This sandwich was amazingly good, the best of the bunch. All the elements worked well together but the star, as it should be, was the roasted pork, which was among the best roasted pork I've ever had. Perfectly seasoned and in harmony with the gruyere, pickles and dijon. 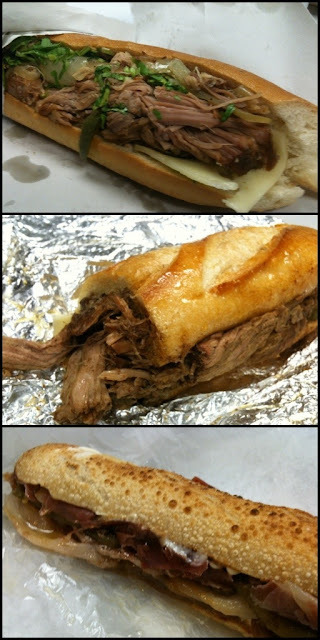 SUNdeVICH has a nice variety of sandwiches, and I look forward to trying some of the others. Pepe, Pepito de Ibérico ($20). Famous chef Jose Andres made headlines when he started his D.C. food truck Pepe last summer, which offers a menu of sandwiches not dissimilar to what you can get at his Jaleo. Particular interest was generated by his audacity to offer a $20 sandwich from a food truck. The imported meats--seared ibérico pork and serrano ham--are what drives the cost. Is it worth it? It's tasty, but not $20 tasty. Served along with roasted green peppers, caramelized onion and aioli, I thought my sandwich was too greasy (take lots of napkins if you eat this on the street). Definitely not bad, but probably my least favorite of these three. Interesting about the Jose Andres sandwich. For $20, it should be one of the most amazing sandwich experiences ever. Sorry to hear it isn't. Just goes to show that price isn't always an indicator of overall quality. Yeah, It was a good sandwich but not the most amazing thing ever.